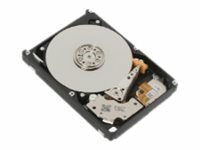 The AL14SEB enterprise performance HDD models deliver excellent performance in a compact, power-efficient form factor. Engineered for mission-critical IT operations, the AL14SEB models support 12.0 Gbit/s SAS and provide the native format required for legacy applications and operating environments while delivering sustained transfer rates. In addition, the AL14SEB series helps to reduce operating costs by improving access time and reducing power consumption.